When I began writing, years and years ago, it was in the spirit of helping people survive and thrive through difficult times. The mother, nurse and counselor in me searched for ways to give wounded people answers—not so much to get rid of the problems, though that can happen, but to work through their struggles and come out stronger, more secure, and better able to cope with whatever life throws their way. If you are wounded and looking for hope and help, you may want to read The Humpty Dumpty Syndrome: Hope and Healing for Broken People, a non-fiction book for helping people through difficult times. (Now available on Amazon in Paperback as well as on Kindle. Even now, after over sixty books, helping people continues to be my goal whether I write how-to books or novels; whether I write for adults or for children. These days I focus primarily on writing mysteries, and/or romantic suspense. My newest ventures are with e-books and you can find many of my novels on Amazon or other electronic book sites. I've recently made available on Kindle, my newest romantic suspense series, The Artison Mysteries, Deadly Deception, The Quiltmaker's Daughter, and Watercolor Dreams, plus The Helen Bradley Mysteries, Death on Arrival, Now I Lay Me Down to Sleep, Red Sky in Mourning, A Haunting Refrain and When Shadows Fall. You can find a complete listing od my novels on my web site under the Books heading. And check out my Writing Life blog where I posted my awesome Around the World cruise experiences and will continue to post my philosophies, thoughts and snippets of my occasionally adventuresome life. Oh, yes, I also love food and have developed The Healthy Norwegian Blog. 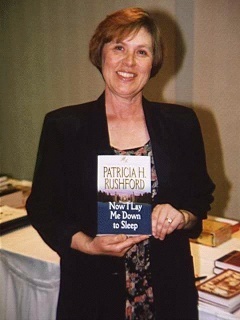 Internationally known author and speaker, Patricia H. Rushford has book sales of over a million copies. She has written numerous articles, authored over fifty books, including, What Kids Need Most in a Mom, Have You Hugged Your Teenager Today, and It Shouldn't Hurt to be a Kid. She also writes a number of mystery series for kids and for adults. She's written the The McAllister Files, The Angel Delaney Mysteries, The Helen Bradley Mysteries and several romantic suspense novels, Her books for kids include the best selling Jennie McGrady Mysteries, The Max & Me Mysteries. and a young adult novel, Kristen's Choice. Her latest releases are romantic suspense novels in the Artisan Mystery Series: The Quiltmaker's Daughter, Deadly Deception and Strangers In the Night. Other books include four novels written for Guidepost Books. She has recently released The Helen Bradley Mysteries on Amazon. Her mystery, Silent Witness, was nominated for an Edgar by Mystery Writers of America and won the Silver Angel for excellence in media. Betrayed was selected as best mystery for young adults The Oregonian (1997) and won the Phantom Friends Award. Morning Song (now Sins of the Mother) a romantic suspense, won the Golden Quill Award for Inspirational Romance. Patricia is a registered nurse and holds a Master's Degree in Counseling. In addition, she conducts writer's workshops for adults and children. She has served as the co-director of Writer's Weekend at the Beach as well as the director of the popular Oregon Christian Writer's Summer Conference. In 2011, she served as writing instructor on a world cruise traching over 50 times on different topics. The experience of a lifetime. In March of 2019, she was selected by her High school, RA Long in Longview, WA to recieve their "Lifetime Achievement Award." Pat has appeared on numerous radio and television talk shows across the U.S. and Canada. She lives in the Pacific Northwest with her husband, Ron. Patricia is available to speak at schools, and conferences, for book clubs, church groups retreats, etc. She combines her speaking and writing talents to bring inspirational and motivational workshops and retreat programs to men and women across the country. Pat is also available to teach writing classes, conduct workshops, and speak at assemblies at your grade school, junior high, and high school. How can you take advantage of this unique opportunity? Contact Patricia for details.